What foreigners always notice in Zagreb is an unusually large number of bakeries; it seems that every tiny street has its own one. Croats really do eat lot of bread, and the bakery is usually the first resort when you are outside and get hungry (we don’t have a big tradition of Asian fast food, falafel and similar). But one bakery stands out from this multitude: Trajković bakery. Founded back in 1925, this small family business is the oldest bakery in Zagreb still running. And it’s the only bakery which still uses a wood-fired oven. When I enter the shop, I feel like stepping back in time – even the visual aesthetic comes from another time: its austerity is totally opposite from the shiny, crammed modern bakeries. While modern ovens (gas or electric) spend lot of energy and cool fast, Trajković’s wood-fired oven, inlaid with a 50cm-thick brick wall, keeps the same temperature over 24 hours, significantly affecting the taste. What also makes their bread so special are the traditional recipes, some secret ingredients and a very crispy crust. The soft crusts in modern bakeries come from the chemical additives. There’s a circle of faithful customers who only buy bread here and nowhere else, sometimes traveling from other parts of Zagreb. Some even come from other cities, buy reserves and freeze them. 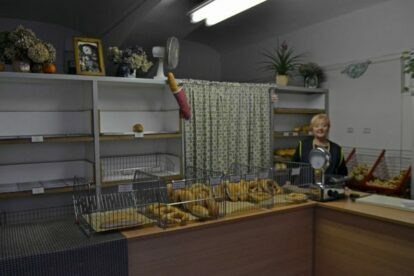 The bakery is a bit off-centre but I would definitely recommend taking a walk and checking why at the end of the day its shelves are always empty.